If you’re afraid you’re starting to slip and you want to boost the mental faculties some, then brain training games are a good way to do. They help you sharpen the mind, are easy to use (I’ve started taking mine to the bathroom with me) and are fun to besides. 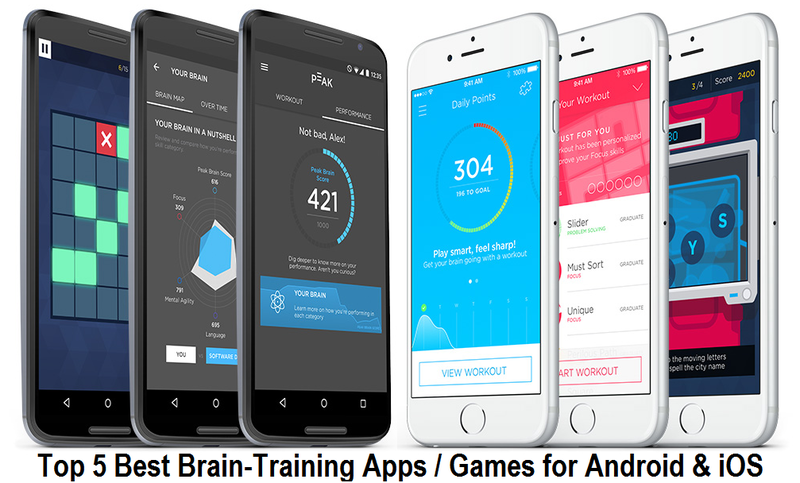 Below are the Reviews of Top 5 Best Brain-Training Apps and Games you must-have on your Android and iOS powered smartphones and tablets. The problem, of course, is that many of them promise a great deal but fail to deliver. For that reason, you’ve got to pick your game well. For that reason, we thought we’d collect some of the absolute best ones out there, so that you don’t have to do all that reading, searching and thinking yourself. After all, that’s what the mobile apps and games are for. The Peak is a great looking little app that uses the now infamous freemium model. That means that you can download the basic version for absolutely nothing, but if you want to access some of the most advanced features, you’re going to have to start coughing up. There are more than 30 games that you can play and they’re wonderfully varied so that you don’t end up actually getting bored (Which is always a risk). I personally like Freemium as it gives you a good idea of what’s possible. If you do decide to pay to get full access it will only put you back a couple of bucks a month. It’s available for both Apple iOS and Google Android. A great choice to get you going is the brain training game Elevate. It is simple, has great visuals, good mini-games that are easy to understand yet go in depth enough to make it really work and a good layout too. The games (there are more than 30) test memory, focus, maths, comprehension and more. It has a good addictive feature, where it tracks your days logged in – something it calls streaks. What I also personally like is that the difficult will naturally rise as you gain expertise, so that you’re always sure to be at a level that isn’t boring but isn’t impossible. This one is also fermium. It will put you back a bit more than Peak, but it too won’t break the bank. There is an Android version and an iOS version. I just love that name. Lumosity. It’s like word candy. The app is pretty damned good as well. It’s actually been around the longest (that’s probably why you’ve heard the name before), but don’t take that to mean it’s the most outdated. Instead, they’ve done their best to keep it up to date and to learn from the experiences of their user base. This has made it so that it advises you an actual training regime, letting you play different games each day so that you don’t just end up really buffed up in one mental area while leaving the other deficient (like somebody who only ever trains their biceps). Again, the game is Freemium and here it’s a bit more expensive to get the full features. That extra bit in price is compensated by the fact that you can play it both on your computer and on your phone, which is a nice touch. As you probably expected, this one too is available for Andriod and iOS. Don’t let the rather mundane name fool you. This is another great choice, with a modern take on the brain training game. There are more than 35 games here, which have been cleverly grouped into different workout sessions so that you don’t end up getting bored with any of them. Another nice touch the game has is that it doesn’t just help you boost your natural IQ, but also your EQ (which is your emotional intelligence for those of you not in the know). You can find an inspiration in it. EQ has been claimed to be just as important as IQ, as it measures how well you can motivate yourself, understand other people’s emotions and understand why you feel the way you do. Just like Lumosity, this one can also be played on the computer. And just like every other one mentioned so far, it too is available on both the iOS and the Android. No, this one does not allow you to manipulate other people’s mental powers like Magnet manipulates metal. Still, it’s almost as good. This one is far more game-like than the other brain-training game, with the five choices on offer really giving you a run for your money. Don’t take that to mean that it doesn’t have all those features that you’ve come to expect, though. It will still train up your memory and your cognition and will still track how what and where you’re improving through an advanced stat screen. This one’s a good choice if with you the focus is on the game part of brain training game. Another feature I liked is that it pulls in extra information from such places as the Apple Health App to give you a better idea as to how you can improve your life overall, by – for example – improving how much you exercise and how much you sleep. Again, it’s freemium, but – and boy it’s a shocker – you can only get this one on Apple iOS powered iPhone, iPad and iPod touch devices. That one came right out of left field, didn’t it? Now, as they’re all Freemium, make sure that you try them all out before you make up your mind. Heck, in trying all of them out you might well find that you don’t need to make up your mind at all and that you can switch back and forth between all five of them and in the process work your brain out from here to next Sunday. Of course, then you’ll have to keep track of what you’re doing on what app, which might get a little tiring in and of itself. Still, you can’t have it all, can you?